Saxophonist / composer Levi Saelua has worked as a professional musician since the age of 16. He has had the opportunity to perform with artists in a wide array of genres, from jazz to classical, hip hop to bluegrass. Born and raised in Northern California (a graduate of Rio Americano High School), Levi furthered his studies at the Eastman School of Music in Rochester, NY, studying with composers Bill Dobbins and Dave Rivello, and saxophonists Chien-Kwan Lin, Jose Encarnacion, and Charles Pillow. 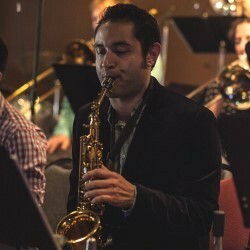 Levi has performed and/or studied with artists such as Maria Schneider, Bob Brookmeyer, Jeff Beal, Fred Sturm, Bob Mintzer, Ryan Truesdell, and the Nelson Riddle Orchestra. He has written, produced, and played on albums for groups in California, Chicago, and New York, and has traveled the world performing for audiences in the US, Australia, Asia, and Europe.